As I mentioned yesterday, during our trip to Paris last October we visited the mother of all Parisian art museums, the Louvre. 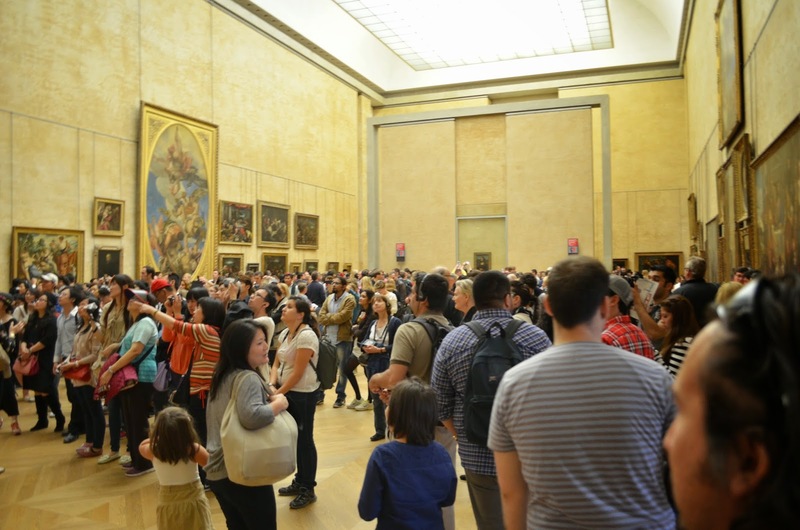 It's actually one of the largest, and certainly the most-visited museum of art in all the world. 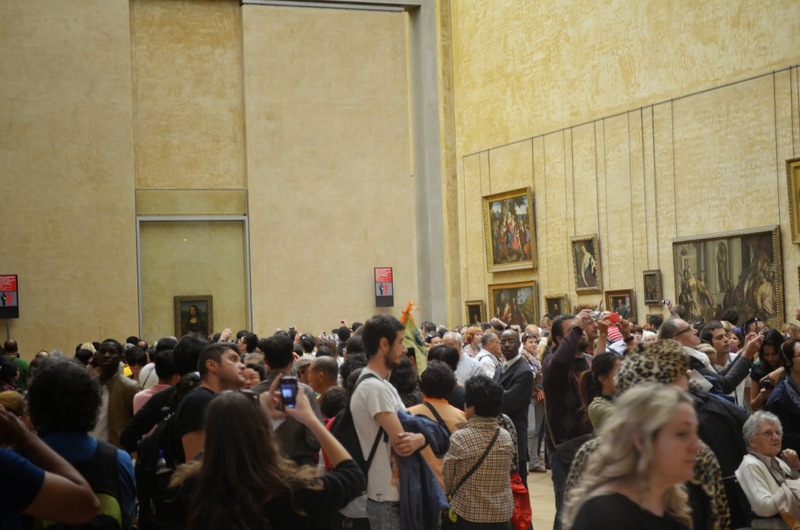 There were 9.344 million guests in 2013. We make up four guests in that enormous number! 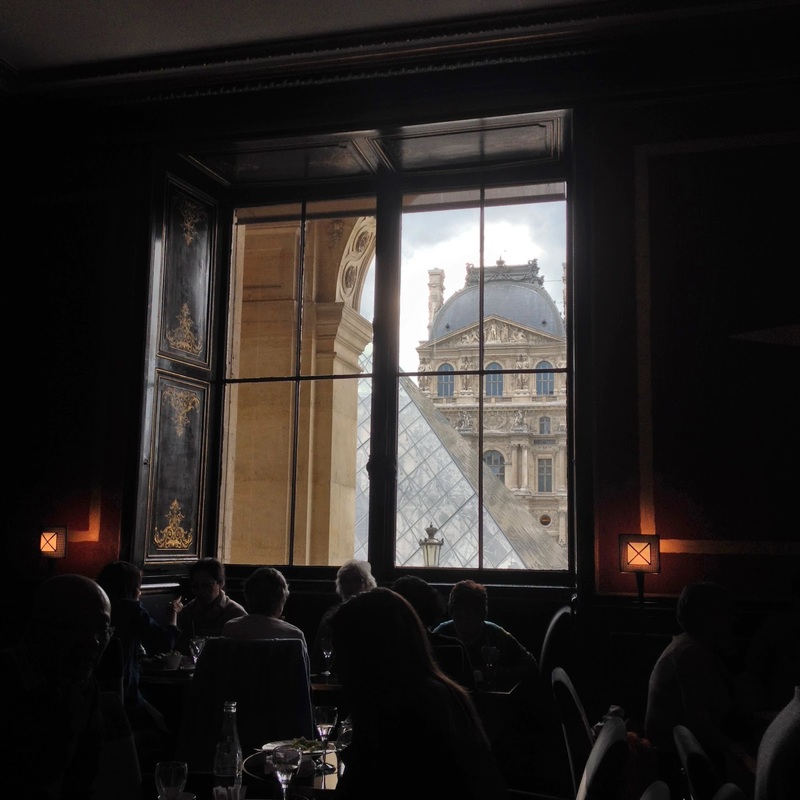 The day we visited the Louvre was like a dream. 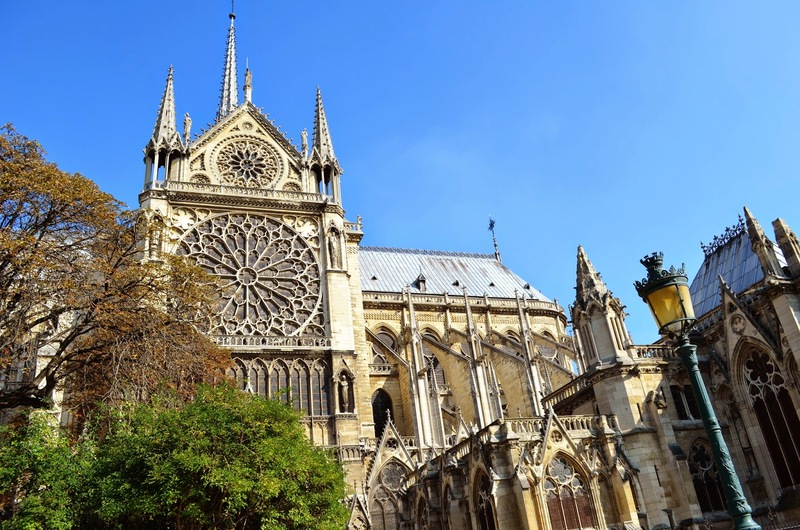 We started the morning with a quick stop at a Starbucks for the free wifi so our maps would work, then we found our way to the Cathedral of Notre Dame, which started construction in 1163. That is over 600 years before the United States of America was born! As often as we travel to places usually seen only on post cards, it's hard for me to still get goosebumps when looking at a building. But the beauty of Notre Dame actually made me short of breath. 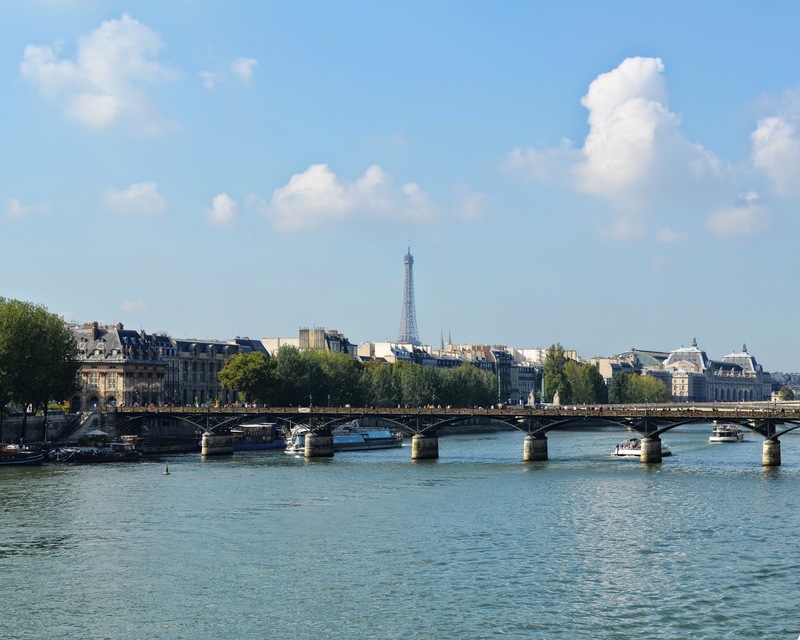 It also made me all hot and sweaty, but that was a constant theme throughout our trip to London and Paris, which took place just three months after my surgery when my hot flashes were out of control. 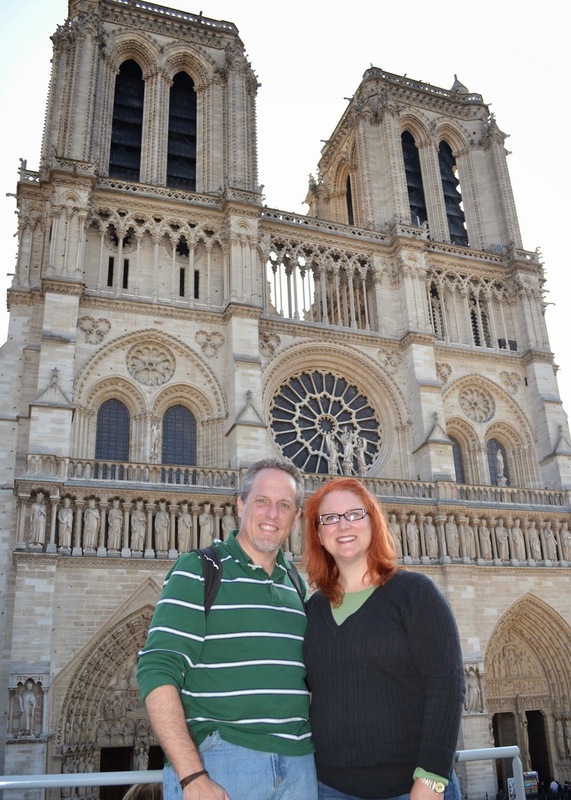 We chose not to go into Notre Dame for a couple of reasons. First, the cost was high and the wait was long, and we had precious little time to explore all that we wanted to do in Paris. And second, while in London, we visited a cathedral which was so breathtaking it will get a post all of its own. And because it amazed us all so much, I didn't want to muddy my memory of it by visiting any other cathedrals in Europe on this two week trip. Plus, the outside of Notre Dame is so rich and detailed it was completely satisfying to just view the exterior. 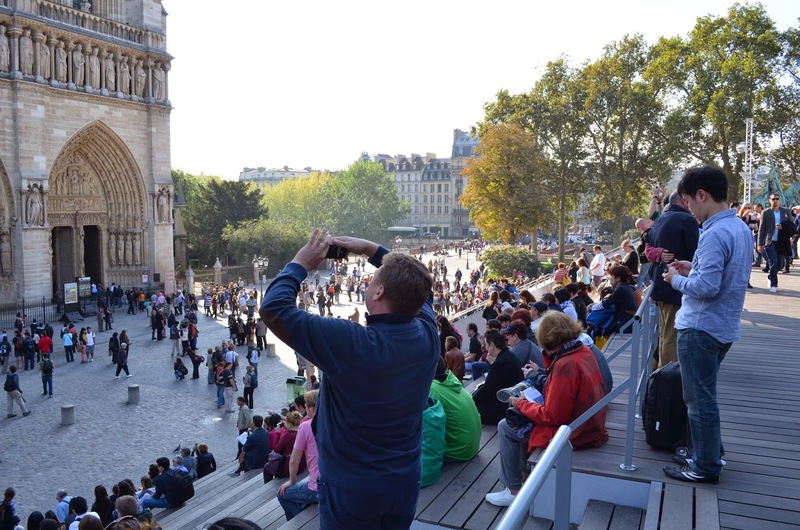 Most of the large and famous buildings and sites in Paris have lots of outdoor seating where people come and bring their lunch or a book to pass an hour or so on their lunch breaks. This alone made me want to claim Paris as our next home! My friend Dora in Macau gave birth to her twin daughters just adjacent to the Cathedral. I would definitely want to stay in hospital longer if this were my view from the birthing suite! There are hundreds of saints pictured on the exterior. 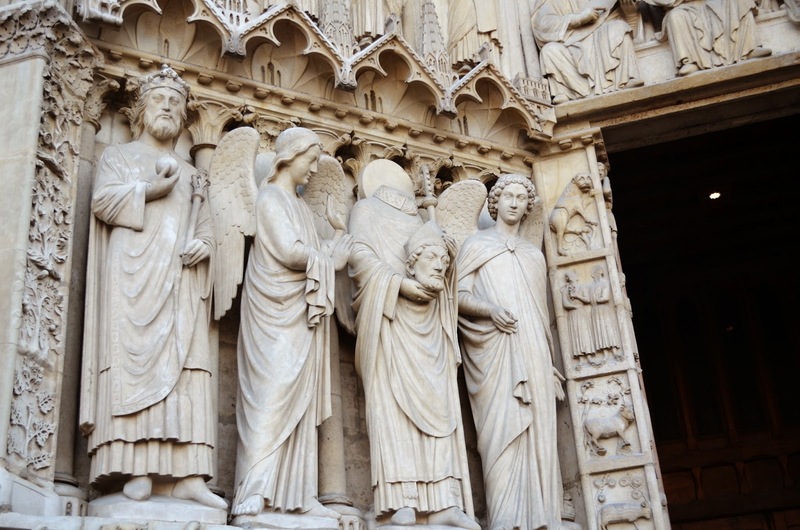 Though hard to pick a favorite, I'm going to go with Saint Denis, who got his claim to fame after being decapitated in the year 257. He stood up and collected his head and then walked six kilometers before collapsing. Pretty heady stuff, huh? Heh-heh. Here he is, hat and head in hands, flanked by a couple of angels. Here's the side of Notre Dame, which was actually one of the first cathedrals in the world to use flying buttresses, those arches that help support the weight of all that rock construction. After a leisurely stroll past book sellers and art hawkers, we finally arrived at the backside of the Louvre. Once again, walking in the courtyard and seeing the iconic glass pyramids took my breath away. I felt like my eyes were guilty of gluttony, taking in so much beauty which I'd only ever previously seen in photographs. And look at that sky! My heart is filled with longing for that rich blue on what is a pretty yucky grey day here in Shanghai. We made a quick stop for late lunch, early dinner at Cafe Marly (just out of frame to the right of this photo) where our friends Francois and Kellee were engaged a few years ago when they lived in France. 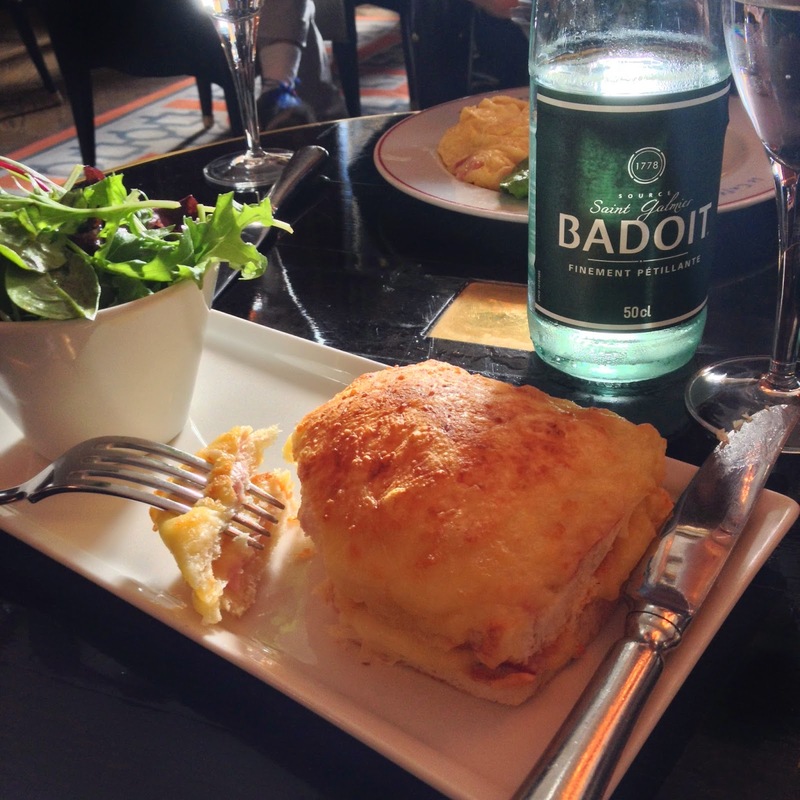 Sparkling water and a Croque Monsieur taste so much better in a place of such beauty! 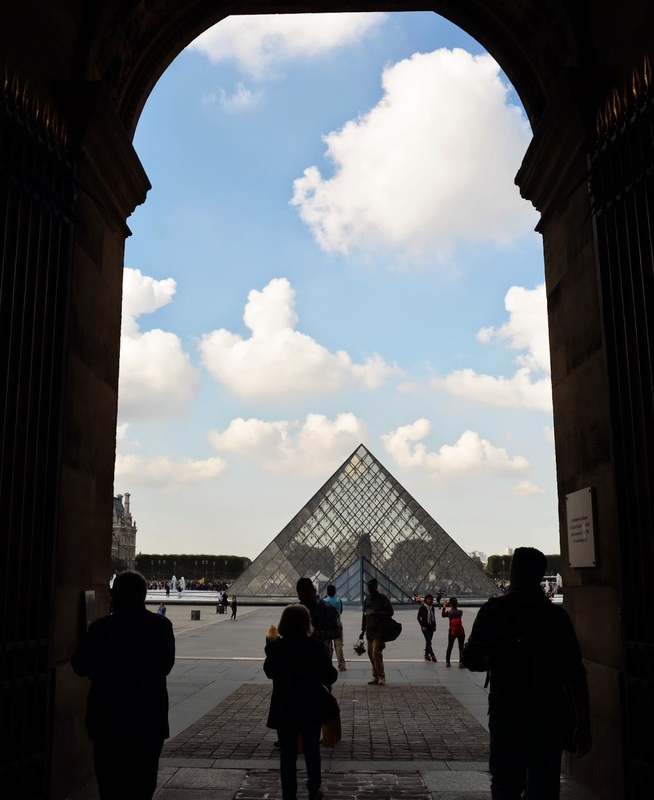 The glass pyramids hold the entrance to the Louvre Museum. The were designed by I.M. Pei (who also designed the Macao Science Center) and opened in 1989. This site dates back to medieval times, and far in the most subterranean sections there are the ruins of a moat from that early 12th century. 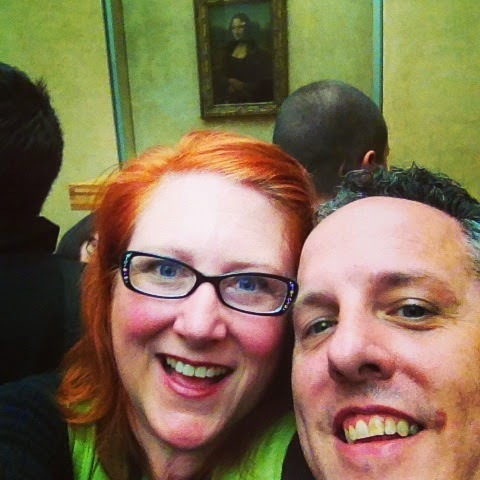 Because you can spend a week in the Louvre and still not see every piece in its vast collection, we prioritized. Everyone got to pick one thing. I chose the Mona Lisa, Michael chose the Venus de Milo, Nathan chose a statue of the Sphinx, and Benjamin chose the original subterranean moat. 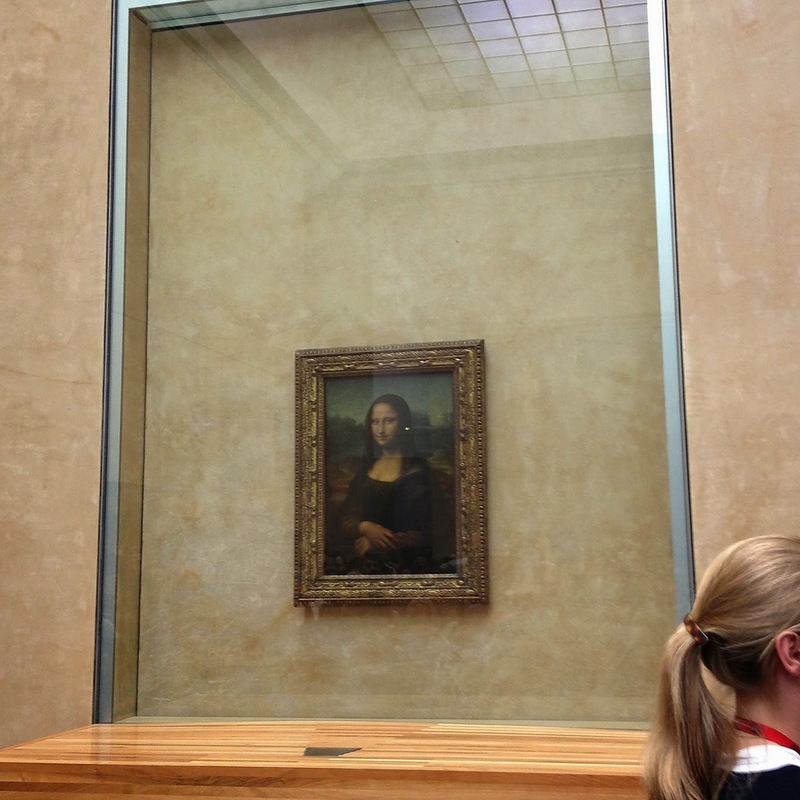 We had roughly two and a half hours to see just these four things, so we raced to our first destination, the Mona Lisa. 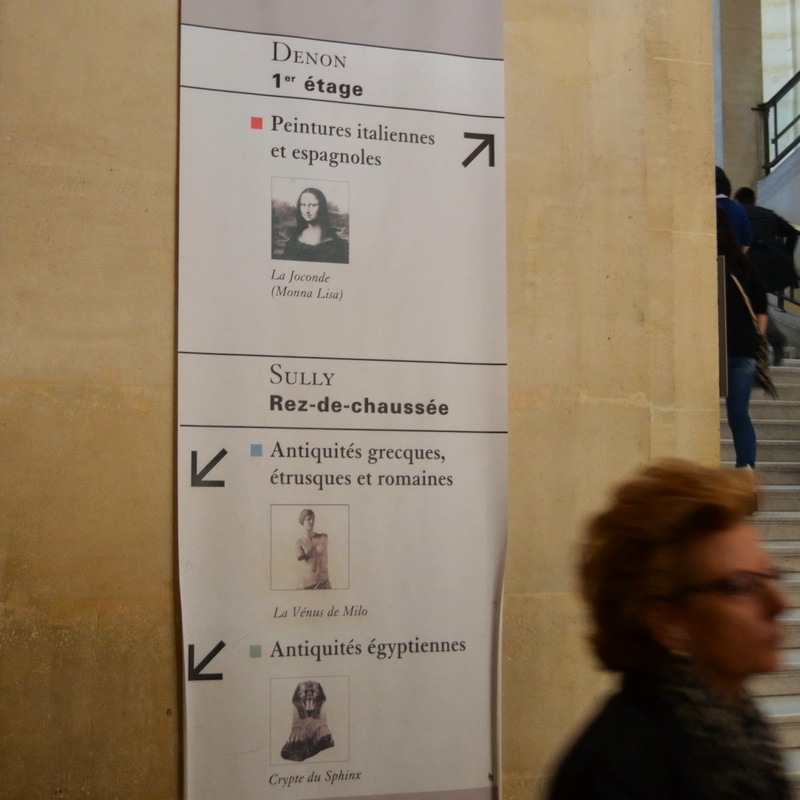 The museum helpfully posted signs with arrows guiding you straight to her, with her proper name, La Gioconda. Or in French, La Joconde. Though they didn't really take us straight there. It was a very winding, circuitous route. I suppose they were hoping guests would stop to appreciate some of the lesser known, but no less beautiful, works of art on display. But we were not persuaded to stop! We arrived short of breath in the gallery which held the very petite work of art. Can you see her? On the far side of the room behind the crowd? 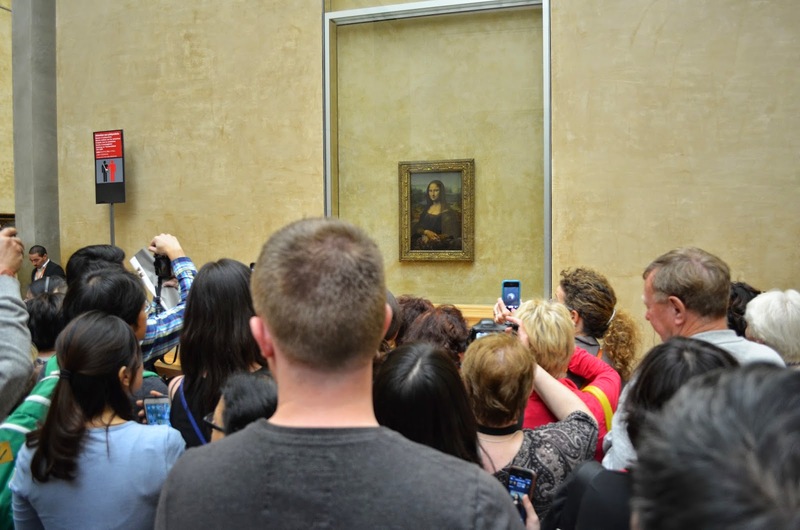 Upon entering such a crowd, you may think our enthusiasm for getting a close up view would be daunted. But no! We've been living in Asia for the last three years, and life in China teaches you about how to get to the front of a crowd with ease. I looked at the boys and said, "see you at the front," and we all waded in for a front row view. You know what surprised me the most? The teeny-tiny size. You could make a screen print of the painting + frame and it would still fit on the front of an adult tee shirt. This was as close as we got. There was a waist-high barrier with a closer area which this blonde teacher entered with a docent and a group of tiny school children. I was far too tall to pass as school child, so I was content with my view. And of course, Michael and I paused to take a selfie. Because that's what one does when you're in the presence of such a celebrity. And of course, the celebrity totally photo bombed our selfie. That Mona Lisa. She's always gotta be the center of attention, doesn't she? We'll pause here, and let her have her moment! 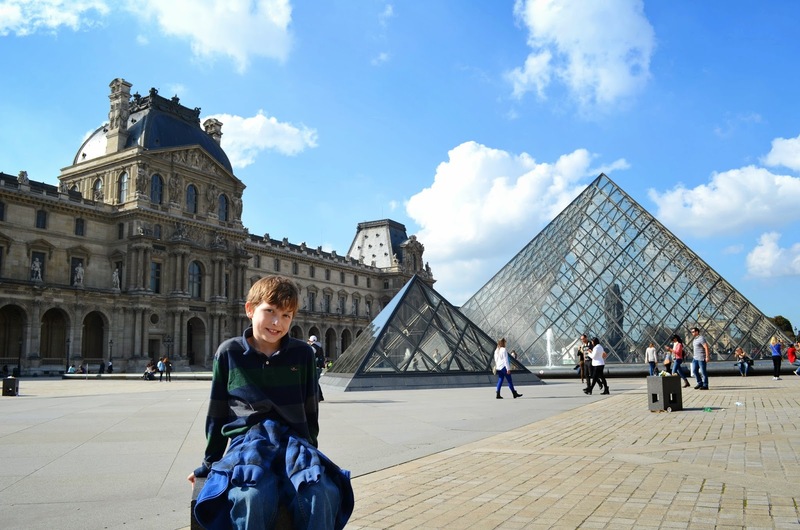 Back soon with more from our whirlwind race through the Louvre! I'm still stuck on the reality of her size too. Sigh. I wonder what gave me the impression it was bigger?